Alexander Wurz (born 15 February 1974) is an Austrian former professional racing driver, driver training expert and businessman. He competed in Formula One from 1997 until 2007, and is also a two-time winner of the Le Mans 24 Hours. He is currently under contract to race for the Toyota factory racing team in the WEC (World Endurance Championship). He is linked to Formula 1 as consultant, expert for TV and media, Williams F1 Team's driver coach, member of FIA Institute safety group, FIA road safety ambassador, chairman to the GPDA (Grand Prix Drivers' Association), and works occasionally as F1 driver steward. Wurz and his father Franz Wurz established Test & Training International, a leading driver training and road safety expert group. Born in Waidhofen an der Thaya, Wurz first tasted competition in the BMX World Championship, which he won in 1986 at the age of 12. This gave him an underlying physical fitness suitable for motor racing. In 2000, Wurz returned somewhat to his cycling roots, starting an MTB team with countryman Markus Rainer. The team, Rainer-Wurz.com, is currently sponsored by sponsors McLaren, Siemens, and Cannondale amongst others. They are multiple World Cup winners. In the early 2000s, niche bicycle brand Katarga presented a limited edition high-end mountain bike called the Alexander Wurz EVO SL, whose frame prominently featured Wurz's autograph. Like most Formula One drivers, Wurz's motorsport career began with karting. In 1991, Wurz drove in Formula Ford. In 1993, he switched to the German Formula Three Championship. During his time in Formula 3, Wurz crashed out of the lead at a race at AVUS in 1995 after a collision with the safety car. From 1996, Wurz drove an Opel Calibra for the Joest Racing touring car team in the DTM. Also in 1996, Wurz, together with Davy Jones and Manuel Reuter, won the Le Mans 24 Hours and in so doing became the youngest ever winner of the 24-hour race. He still holds the record to this day. 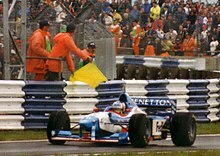 Wurz at the 1997 British Grand Prix at Silverstone. Wurz's Formula One debut was on 15 June 1997 at Montreal for Benetton filling in for fellow Austrian Gerhard Berger, who couldn't race due to illness. Wurz impressed with a podium position in his third race (1997 British Grand Prix) before returning to being a test driver upon Berger's return to the cockpit at the German Grand Prix, which Berger won. However, Wurz was rewarded with a full-time race seat for the 1998 season with Benetton and spent three more seasons at the team, partnered each year by Giancarlo Fisichella. A strong start to 1998 suggested a bright future, and even attracted the interest of Ferrari, but the three-season stint at Benetton turned out to be a disappointment. Toward the end of his Benetton time, Fisichella produced better results, although in 1998 Fisichella had one point less than Wurz, finishing 9th whereas Wurz finished 8th in that Season with 17 points (together with Heinz-Harald Frentzen, who finished 7th.) and five 4th places. One notable race was the 1998 Monaco Grand Prix, where he was running 2nd ahead of Michael Schumacher for a brief period. His hopes of a podium finish were ruined when Schumacher tried to pass through at Loews hairpin, but collided together with him and like Schumacher's Ferrari, his suspension broke, causing him to spin off and crash at the Nouvelle Chicane exiting the tunnel. He retired and Schumacher finished 10th in the end after the German pitted for repairs. The 1999 season was a disappointment for both drivers with the uncompetitive B199 (although Fisichella scored a podium in Canada), but the 2000 season was disastrous for him, scoring points only at the Italian Grand Prix, while his teammate scored podium finishes three times. For 2001, Benetton's last season before its transformation into Renault, he was replaced with Jenson Button. Wurz testing for Williams at Silverstone in 2006. In 2001 he took on the role of third (i.e., test) driver for McLaren. In April 2005, with Juan Pablo Montoya injured, Wurz drove for McLaren in the 2005 San Marino Grand Prix, finishing fourth in the race, but taking third place after both BAR-Honda drivers were disqualified. This gave him a unique record, as no other driver has had such a long gap between podiums as Wurz, who went eight years without one. His drive at Imola was all the more notable because he was still not comfortable in the car, and at times had to drive with one hand. Since his signing to McLaren as test driver, Wurz had been eager to return to racing. At various times during this time he was linked in rumours to a return to a full race seat. His large size for a Formula One driver (186 cm/6'1.5") has perhaps been a factor that has not helped. 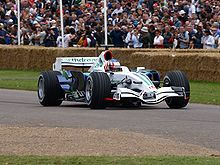 In fact, because they were so sure he would be driving for Austrian-owned Red Bull Racing in 2005, the designers at McLaren neglected to allow for his size, meaning he could not physically fit in the car. In 2003 he was strongly linked to a race seat at Jaguar, where the under-fire Antônio Pizzonia was struggling. However, McLaren were struggling with their abortive new car and blocked the move to retain Wurz as a development driver. Jaguar then decided to give Pizzonia more time to prove himself, before drafting in Justin Wilson. Wurz at the 2007 Malaysian Grand Prix. Alexander Wurz signed a deal with WilliamsF1 to become the team's official test and reserve driver at the beginning of 2006. He drove the third car at all Grand Prix Fridays in 2006. It was announced on 3 August 2006 that Wurz would replace Mark Webber as a race driver at Williams for the 2007 season. This was Wurz's first full-time race drive since 2000, and his teammate was Nico Rosberg. At the Monaco GP on 27 May 2007, Wurz scored his first points for the Williams F1 team, finishing in 7th place after qualifying 11th. He came 3rd for the 3rd time in his F1 career at the Canadian Grand Prix on 10 June 2007, staying out of trouble from 19th on the grid in an action packed race. He actually damaged his rear wing early on in the race, but battled against it and finished on the podium. He nearly repeated this at the European Grand Prix, but just didn't make it past Mark Webber at the final chicane. That race turned of to be Wurz's last points finish and especially from now on, teammate Rosberg distanced him. The qualifying for the Japanese Grand Prix, where Rosberg started from 16th on the grid, although he lost 10 places due to an engine change in practice, and Wurz started even further back in 18th without being put further back on the grid. On 8 October 2007 Wurz announced his immediate retirement from Formula One, meaning that the 2007 Chinese Grand Prix was his final race. The official Formula One website announced that "Williams driver Alexander Wurz has confirmed that he is to retire from Formula One racing with immediate effect". Wurz himself also released a statement saying "I would like to thank my family and fans, everyone at AT&T Williams and my previous teams, as well as the media, for all of their support during my Formula One racing career. I may race again, perhaps in Le Mans or other categories and certainly some of my time will now be committed to the very important subject of road safety." The 33-year-old cited doubts over his own commitment as the main reason for his departure despite having a relatively successful season racing with Williams. He was replaced by Williams test driver Kazuki Nakajima for the final race of the 2007 season in Brazil. Wurz demonstrating a Honda RA108 at the 2008 Goodwood Festival of Speed. Wurz was the Honda F1 test driver for the 2008 Formula One season, a role he kept on the transition to Brawn GP in 2009. For the 2012 Formula One season, Wurz rejoined the Williams F1 Team, this time to guide the team's inexperienced drivers Bruno Senna and Pastor Maldonado. Wurz signed with Peugeot to be part of their driving squad for the 2008 24 Hours of Le Mans and he also participated 1000km of Spa in the Le Mans Series. In 2009, together with Marc Gené and David Brabham, he took outright victory in the Le Mans 24 Hours, driving a works Peugeot. The 13-year gap between Wurz's victories is the largest in the event's history. Together with his victory in 2010 of the 12hrs race of Sebring with Marc Gené and Anthony Davidson and his victory of the 1000 miles race of Road Atlanta with Stéphane Sarrazin and Franck Montagny in 2011 it made him win the 3 big Sportscar Classic Races in a Peugeot 908. Wurz continued to race for Peugeot Sport Total through 2010 and 2011, though no further Le Mans wins were forthcoming. In November 2011, Toyota Motorsports confirmed Wurz as one of their factory drivers for the companies planned return to the 24 Heures du Mans in 2012. Wurz will drive their new LMP1 Hybrid Prototype alongside Nicolas Lapierre and Kazuki Nakajima. In May 2018 Wurz announced that he would follow in the footsteps of his father by making his competitive rallycross debut at the FIA World Rallycross Championship's World RX of Norway at Lånkebanen the following month, driving a Ford Fiesta Supercar for MJP Racing Team Austria. Wurz is involved in many projects regarding road safety and driver education and training. In 2006, he and his father founded the company Test and Training International, a leader in the field of road safety and driver training. He also works closely with the FIA (Fédération Internationale de l'Automobile), since 2011 as an operating partner of the FIA Institute Young Driver Excellence Academy. In the 2008 Singapore Grand Prix, Wurz drove the medical car after regular driver Jacques Tropenat fell ill.
Wurz lodged an entry for his own team into Formula One (announced on 31 May 2009) but the application was unsuccessful. Team Superfund was one of several new applicants hoping to compete in the sport from the 2010 season onwards. It was believed that Wurz would prefer to align the team with an existing constructor based in the UK, perhaps renting space, facilities and staff from its factory, while Superfund takes time to build up its own headquarters, possibly based on existing resources in Austria. The team would have been funded by Christian Baha, the owner of the Superfund Group, and the cars would be powered by Cosworth engines. Wurz is the second son of former rallycross driver Franz Wurz, who won the European Rallycross Championship in 1974, 1976 and 1982. Wurz is married to Julia Horden and has three sons: Charlie, Felix and Oscar. He used to race with different coloured boots on each foot, but since his return to racing in 2007, he wears matching pairs. On 10 November 2015 Wurz announced via his Twitter that after 20 years he would retire from racing. 1 Driver run for the Intercontinental Le Mans Cup, no points awarded for the Le Mans Series. 1 Driver run for the Intercontinental Le Mans Cup, no points awarded for the American Le Mans Series. ^ "Mountain-bike Alexander Wurz Edition". Veni, vidi, velo!. 2014-04-21. Archived from the original on 2014-05-02. Retrieved 2014-05-01. ^ a b "Third-time plucky for Peugeot". Autosport. 196 (12): 36–47. June 18, 2009. ^ "Wurz confirms immediate retirement from F1". autosport.com. 2007-10-08. Archived from the original on 11 October 2007. Retrieved 2007-10-08. ^ "Wurz announces retirement from Formula One competition". formula1.com. 2007-10-08. Archived from the original on 11 October 2007. Retrieved 2007-10-09. ^ "Williams confirm Nakajima for Brazil". autosport.com. 2007-10-09. Archived from the original on 11 October 2007. Retrieved 2007-10-09. ^ "Wurz joins Honda as test & reserve driver". autosport.com. 2008-01-10. ^ "Wurz retains ties to Brawn GP". autosport.com. 2009-03-29. ^ "Wurz to mentor Williams duo | Williams F1 Team News | Formula 1 Teams | Sky Sports". 2012. Archived from the original on 2 March 2012. Retrieved 28 February 2012. ^ "Peugeot win Le Mans 24-hour race". BBC. 2009-06-14. ^ Ridge, Hal (18 May 2018). "Ex-F1 driver and Le Mans winner Alex Wurz to contest World RX round". autosport.com. Retrieved 20 May 2018. ^ "Wurz drove F1 medical car in Singapore". GMM. 2008-09-28. ^ Strang, Simon (2009-05-31). "Wurz set to lead Superfund into F1". autosport.com. Haymarket Publications. Archived from the original on 5 June 2009. Retrieved 2009-05-31. ^ "Wurz is father for third time – Racing news and opinions – Auto123.com – Canadian automotive network". Archived from the original on 2007-10-25. Retrieved 2007-10-01. 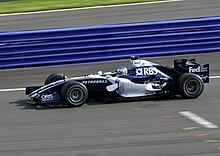 Wikimedia Commons has media related to Alexander Wurz.